We’ve been talking a lot about negative keywords lately and for good reason. They are a great way to streamline your campaigns and save you money! 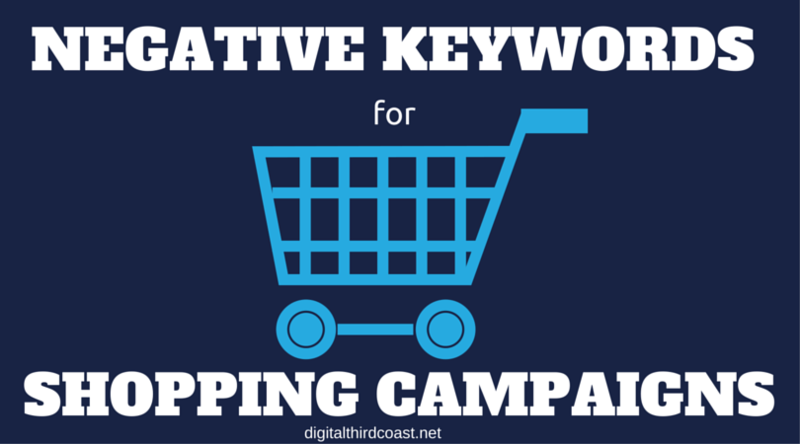 But we haven’t touched on how to use negative keywords in your Google Shopping campaigns. The main difference between Google Shopping and Google Search is the inability to bid on specific keywords – which means you lose a lot of the control you have with keyword lists in Search Campaigns. The good news is that you can use negative keywords. So… it’s really important that you use negative keywords in your Shopping Campaigns. Instead of curating keyword lists, your products are submitted to Google Merchant Center via a data feed. Search terms are matched to your items using your product titles and descriptions. Cool, right? The only problem is that matching is pretty loose. For example, if you sell high-end, cashmere scarves, there’s a good chance your products can match for the term scarves or, worse yet, cheap scarves. This is where being proactive in your negative keyword research will help. Nathan goes into how to find negative keywords in his post on How to Find and Select Negative Keywords. As is always the case, being proactive is only the beginning. As you collect more data, keeping a close eye on your search terms reports is the best way to ensure the health and profitability of your Shopping Campaigns. Let me explain some ways you can use your account’s data to find negative keywords for your Shopping Campaigns. There are other ways you can use negative keywords to make your Shopping Campaigns really rock and roll. The best place to start is in your search terms report. It’s available under the Keywords tab on the Campaign or Ad Group levels of your account, under the Details menu – see the picture below. From here you can get great data on which search terms are triggering your PLAs and decide which ones are not a good fit for your campaign. Using Product Filters can help you organize products into their own ecosystems. 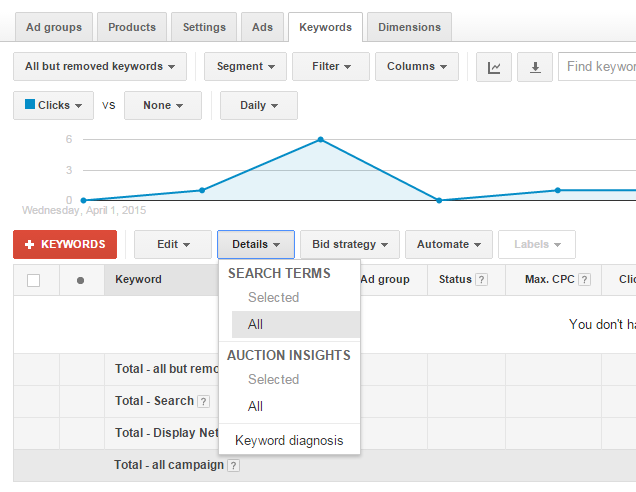 Apart from having better control over how your Shopping Campaign spends its dollars, this will help make it easier to decide which negative keywords you want to use per ad group or campaign. The other benefit of this strategy is enabling the ability to funnel broader terms into their own ad groups or campaigns at a lower bid. Using exact match negative keywords in a Shopping Campaign helps you eliminate some broader search terms without excluding long tail ones. Let’s take a look at those deliciously soft cashmere scarves again. We have an ad group targeted at cashmere scarves, but its budget is being eaten up by the search term scarves. We don’t want to use scarves as a broad or phrase match negative keyword because that will eliminate any search traffic from our ad group. Instead we will add [scarves] as an exact match negative keyword, rendering that high volume search term inactive. In a situation where we don’t want to completely eliminate broad search terms, using [scarves] as an ad group level exact match negative keyword will do the trick. Once that is done, create a clone of the ad group and drop the bid. This is a simple move to allow your more profitable ad groups to focus on search terms with higher purchase intent while spending less money on broad search terms with lower purchase intent. The tactics above are not meant to be set and forgotten. Checking in on your search terms should be a regular part of your Shopping Campaign strategy. I usually find that after you get rid of one pesky search term, another one quickly replaces it. If you have a moderately sized campaign, checking in once a week should be enough to keep your campaigns healthy. Also, since you have your low bid, broad search ad group, you can rest assured that those terms will be funneled somewhere that won’t blow your budget. To make a long story short, a strong negative keyword strategy in Google Shopping can help shape a highly organized and effective campaign strategy as well as maximize your campaign’s ROI. The benefits are two-fold. On one side, you are eliminating irrelevant and unprofitable search terms. On the other, you have the ability to create keyword specific ad groups and campaigns despite not have the ability to use keyword lists. There’s a lot more work involved but the benefits are well worth it. Next Next post: How Much Does SEO, PPC, and Inbound Marketing Cost?